Many will say that social media is a distraction and generally a waste of time, but God can use anything, good or bad, to further His kingdom. In this case, Facebook proved to be an important connection in allowing God to weave this story together. A few weeks ago, we received the bio’s of the families we will be building homes for. All of these are led by Moms who have either been widowed or abandoned, and are doing their best to care for their children. By ‘best’ I mean that these Mom’s are caring for a family on $2 a day….. in a world where food costs are not that different from our own. 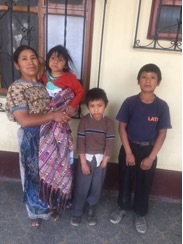 The bio of Angelica Estantzay mentioned that she had 3 children… ‘Rogelio (10) who has never been to school for lack of finances, but instead works in the fields for $1.35 a day to help his mother; Claudia Mariana (10) who is deaf and hasn’t been able to walk since she was a baby – her mother does not know what medical condition she has….. and Sergio Ruben (6) who doesn’t study. When we read about Claudia, a child that hasn’t walked, we wondered if a wheelchair would help her. 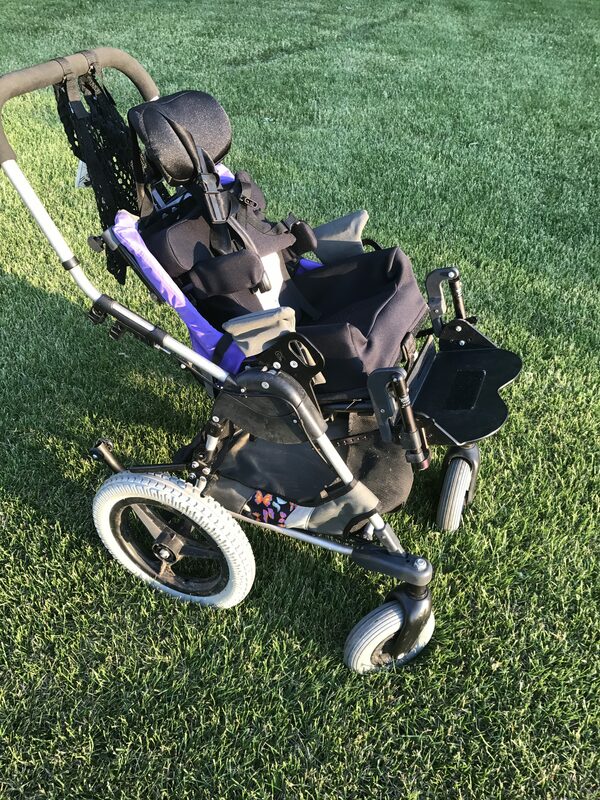 The missionaries, Chris and Donna Mooney, confirmed that she probably will need one, but they didn’t currently have one that small at the Bethel Ministries wheelchair shop. We checked our inventory in Iowa, and we also did not have one that size. (we rarely collect the smaller chairs) We knew we had a container scheduled to ship to Guatemala in August, so we could possibly find one before then and include it on that load…. Or we could pray about it and see if there was any way possible we could deliver it when we build Claudia’s new home. So, 3 weeks before we leave, a million things to do, hmmm… what are the odds? Honestly, I hesitated pursuing this, as I didn’t think we could find one without a lot of time, effort, coordination, and again, time! So we prayed, and God began making it happen. Rick and I agreed that a Facebook post was a good place to start. We have volunteers all over the country who collect equipment for Mission Mobility. Again, my perspective was if we find one, we can at least put it on the container in August… not believing we could get it all coordinated sooner. We also shared this request on our personal Facebook pages, and things started happening…. quickly! Like many others, I have Facebook friends who I have never met personally. I glimpse into their lives thru my newsfeed and they into mine. I am a part of a skincare company who use Facebook in incredible ways for its business. A leader within this company, LeAnne, decided to share my post! That was my first notion that God had taken control of this situation. This leader is connected… all over the country and all over the world. My post was at 10:44am, and she posted at 11:04am…. within hours LeAnne was messaging me that she had found a chair! Praise God! We were elated, but this chair was located in southeastern Kentucky. Many hours away, and no connections in that area. LeAnne was actually traveling that day to London -contacting me between flights or whenever she was able. I thanked God for this chair, and LeAnne who had shared this post, and again settled into the belief that it would be put on the next container in August, as I was sure we could somehow have it in our hands by then. In my thoughts, I had too much to do to coordinate getting this sooner – but then…God. Within 7 minutes of my post, Rick receives a phone call from a ‘neighbor’ Loree. (Loree and her husband Kenny live in our little town of Crawfordsville, and Kenny is a key person in a men’s bible study that Rick hosts.) Loree saw my post on Facebook and happen to be in that exact town that day!!! They were vacationing in an area within miles of this chair!! Yes, Lord… Yes, Lord… Yes, Yes, Lord. Not my plan, but His. This chair was delivered to our doorstep within days of that first request on Facebook. Not only that, but several other chairs were found due to those Facebook posts also. We will be transporting 2 child chairs with us when we travel in a few days. The donor of this chair is a lovely family in Kentucky, who have already connected us to more equipment for future containers. Their daughter used this chair for a time, and by sharing, it will be helping another child AND Mom receive independence! Praise God for these lovely people! Thank you for praying us thru this trip. We cannot wait to share with you when Claudia gets her new chair. This entry was posted in Uncategorized on June 26, 2017 by rfultonmission.